Here's one dude who's constantly building up a "signature tune" for himself, whilst constantly working with both major and also, up and coming artistes in the Nigerian Music Industry. 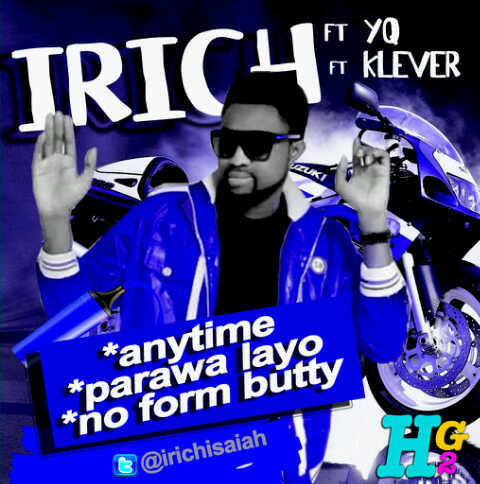 "Irich" a.k.a "FRESH BEAT" is a prolific producer, song writer and also a singer, who's produced for quite a handful of known artistes in the likes of "YQ", "Klever Jay", "Side 1", and a host of others. His current strings of projects have got him dropping 3 fresh singles, on which he's got features from two different artistes on two out of the 3 singles. The first track titled "Anytime" featuring YQ [Storm Records] sidelines the lifestyle of an average dude up in the club, hanging out with his fellow dudes and having girls in the club flock over them. The second single which features "Klever Jay" is titled "Parawa Layo" and it's got a techno-feel, with a dancehall tune. The third single shows Irich displaying his singing capabilities, a song that basically talks about his land [Nigeria] and also kicks against girls who claim to be cool when they aren’t, and it’s titled “No Form Butty”... All songs have been produced by Irich himself, and there’d be more to come over the coming months... ENJOY!! !